In the heart of North Bengal and in the midst of beautiful tea gardens, Father LeBlond School towers majestically on ten acres of land-area on the green hilly terrain with the high Himalayas in full view at a distance. The school is well connected with Airlines, Railways and Road Transport, the nearest city being Siliguri. Away from the crowd and noise, dust and smoke, a moderate climate, pollution-free environment and aesthetically pleasing vista make Father LeBlond School the ideal destination for the joyful learning and all-round growth of young boys and girls. The school aims at providing effective and comprehensive education of quality for the growing generation of all communities. 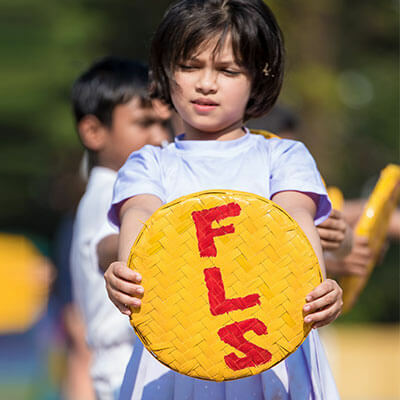 The FLS model of education provides for holistic development of individuals through a plethora of modern and cutting-edge extra co-curricular activities. Highly qualified, trained and experienced faculty supported by Digital Classrooms with a maximum class strength of 30, Regular Remedial Classes, Continuous Assessment Tests, etc. have resulted into consistent top class Board Results and subsequent placements in top draw colleges and universities of the country and abroad. Eminent academicians and school education experts are associated with the school for the administrative competence, academic excellence and efficiency, apart from the School Governing Board. The school aims at an effective education by which character is formed, strength of mind is increased, intellect is expanded, skill is developed and power of judgement is enhanced. We train our students to become morally upright, emotionally restrained, intellectually mature and psychologically balanced to have a cheerful outlook of life. "Padre" LeBlond : To the young boys of St. Paul's School, Darjeeling, the Chaplain, Rev. Canon Kenneth Oscar LeBlond, was an institution. He represented home to the homesick, a mother’s embrace to the love-starved and his eyes brought warmth to cold Darjeeling. His arms were always open, spelling security to little boys lost in the crowd. To those boys, he was a safe haven, always available. Father LeBlond School is inspired after him and it is in his memory that the school is dedicated. It is an honour to name our school after the man we lovingly called "Padre LeBlond". It shall be our endeavor to give our students what he so effortlessly gave us – warmth, love, nurturing and a tremendous sense of security.